The parking proposed adjacent The Common and the Post Office development proved to be a controversial topic at the Public Meeting called to consider various issues around Shoreham on Saturday, 16th March 2019. The Developer of the Post Office project was required to provide 10 parking spots on Cliff Road opposite the Post Office development as part of its Planning Permit issued on 18/6/2014 and following a VCAT decision in 2008. This requirement for parking has therefore been in place for several years. During the period 2015-17, the Common Reference Group in conjunction with Mornington Peninsula Shire (MPS) undertook a series of public meetings which developed the concept of a Common Placemaking Project - including the issuing of questionnaires on what the Shoreham Community wanted for the Common. The majority opinion was that the Common should be closed off to vehicles. There was some disagreement with this proposal but the majority decision prevailed. Funding was provided in 2016/17 to grass the top section of the Common along with extra pathways and trees/shrubs. This work was completed in early 2018. The second phase of the Placemaking project included grassing the bottom section of the Common and closing this off to traffic. SCA requested MPS funding for this project in the 2018/2019 budget but was unsuccessful. Because of the needs of the upcoming Post Office Development and the proposal to eventually close off the lower car park on the Common, SCA requested funding for a Parking Study on the areas around the School Hall, Post Office development and tennis courts. This was granted in the 2017/18 budget and was completed by MPS in July 2018. The study recommended that an additional 16 slots of 60 degree parking be provided on Cliff Road opposite the Post Office (10 from the Developer and 6 from MPS funds). Developer funding plus $50k of MPS funds was provided for this in the 2018/2019 budget. This design was placed on display at the Shoreham community Public Meeting held on 16th March, 2019. 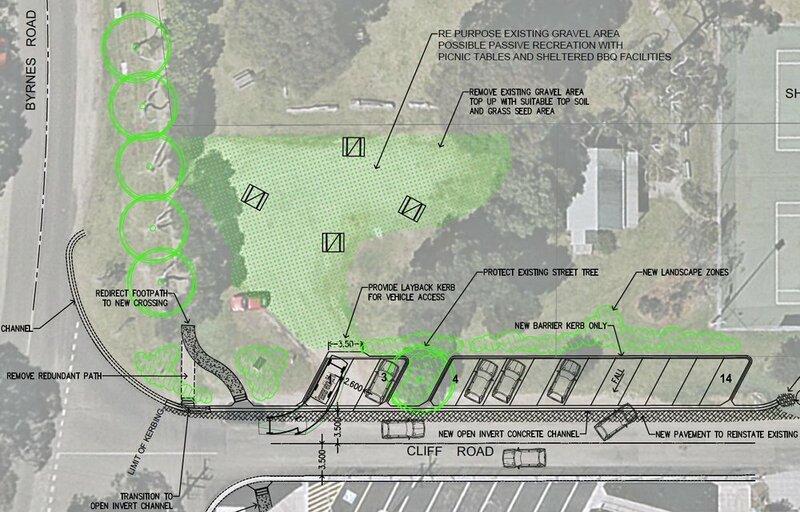 Final design for this parking (now 14 slots in order to save an existing tree and to improve safety near the pedestrian crossing) has been proposed. The amount of funding available has been deemed sufficient by MPS to also proceed with the grassing of the lower Common as part of the Parking development which will eliminate the need to seek extra funding for this in the 2019/2020 budget. 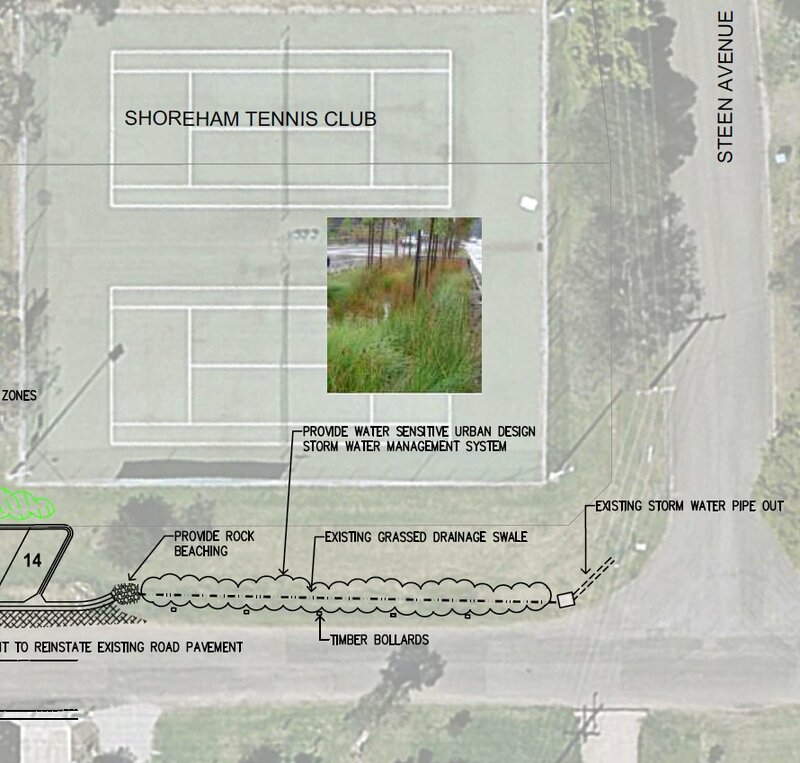 The design selected by the MPS Council for the 14 slot parking includes improvement to pedestrian access to the Post Office from the Common, the inclusion of vehicle access to the Common for Tennis Court maintenance and drainage improvements along Cliff Road down to Steen Avenue. The 14 parking spots are to be bitumen. Some residents of Cliff Road are unhappy with the parking proposal and do not want the lower Common closed off to parking (that infers, although it has not been recognised, that the 10 slots that the Developer is to provide would have to be on the Common!). Some Shoreham residents do not like the parking spots on Cliff Road to be done in bitumen and would like them to be gravelled – they believe this is more in-keeping with Shoreham’s Coastal village character. MPS engineers have explained that gravel is not acceptable to MPS because of future maintenance issues with the parking itself and drainage blockage with gravel after heavy rain. Some do not like the use of bollards. The MPS position is that it has to deal with the permit in force now. The Developer has not made application for a revised permit. However, it is now clear that the Developer does not intend to allow a 40 seat café and shops on the lower level of the Development and may not even allow the Post Office to remain in its existing position. Therefore, the requirement that 10 parking spots be provided opposite the Development may be redundant and, as such, the entire basis of the Parking Study may be wrong. Therefore, some residents believe all work on parking should be stopped until Shoreham is aware of what the Developer is intending to do! The SCA is taking the engineering and planning issues to Council at a senior level. We will provide updates when available. For further information - please contact Alan Fisher ph: 0467 776 854 or e-mail alan.j.fisher9@gmail.com .